In the early 1950s, IBM took note of the increasing construction and operation of toll roads, such as the famous Pennsylvania Turnpike, the first of the modern "pay-by-the-mile" highways. By June 1954, IBM had identified ten such highways in service, eight under construction and another 46 projects authorized or proposed -- for a total of more than 10,000 miles of road. Anticipating a growing need by state and local turnpike authorities for efficient toll collection, IBM developed a new system for gathering and auditing fares paid by motorists. This system, consisting mainly of the IBM Toll Recorder, Dynamic Vehicle Classifier and the IBM 650 Magnetic Drum Calculator, met the requirements of toll road managers and engineers for fast and accurate fare collection, revenue protection and accounting-statistical procedures. An IBM Toll RecorderIBM Toll Recorders were used to validate fare cards by printing and punching techniques. 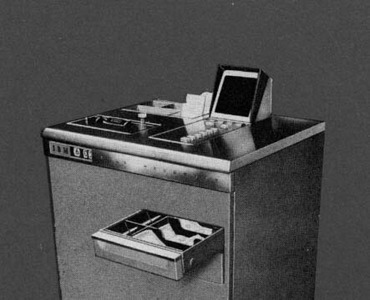 These console units were installed in toll booths and contained fare cards, cash and storage drawers, time indicators, axle keys and classification keys. All Toll Recorders validated the fare cards by printing ticket sequence numbers; day, hour and minute numbers; and the collector's key number. Whatever the virtues of IBM's Toll Collection System, the start of the U.S. Interstate Highway System in 1956 -- which eventually enabled drivers to travel coast-to-coast without traffic lights or toll booths -- soon applied the brakes to this particular line of products.